In this paper we will deal with the question of the translation of the term phantasia, with closely related concepts, with the distinction between Cleanthus’ conception of phantasia and the developments made by Chrysippus. ANNAS, J. (1980). Truth and knowledge. In: BURNYEAT, M et alii (eds.). Doubt and dogmatism. ANNAS, J. (1990). Stoic epistemology. In: STEPHEN, E. (ed.). Epistemology. Companions to ancient thought, vol 1. Cambridge, Cambridge University Press. ANNAS, J. (1991). Hellenistic Philosophy of Mind. Berkeley, University of California Press. ANNAS, J. (2003). Stoic Logic. In: INWOOD, B. (org.) The Cambridge Companion to the Stoics. Cambridge, Cambridge University Press, p.85-123. Augustus Meineke (ed.) (1885). Estobeu. Florilegium, vol I e II (translation, introduction and notes). Lipsiae, Taubner. BAILLY. 2000. Dictionnaire Grec-Français. Le Grand Bailly. Paris: Hachette. Precept? On Music. (translation, introduction and notes). Harvard, Loeb Classical Library. BRITO, R.; DINUCCI, A. “Tradução e Apresentação da Diatribe de Epicteto 1.5”. 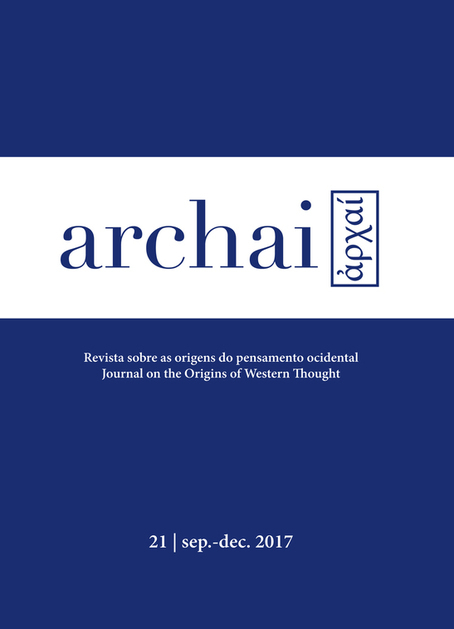 IN: Journal of Ancient philosophy, São Paulo, volume 8, n. 2, p. 116-130, 2014. BURY R. G. (1933). Sextus Empiricus. Outlines of Pyrrhonism. (translation, introduction and notes). Harvard, Loeb Classical Library. BURY R. G. (1935). Sextus Empiricus. Against the Logicians. (translation, introduction and notes). Harvard, Loeb Classical Library. BURY R. G. (1949). Sextus Empiricus. Against the Professors. (translation, introduction and notes). Bury. Harvard, Loeb Classical Library. and notes). Harvard, Loeb Classical Library. FREDE, M. (1983). Stoics and skeptics on clear and distinct impressions. In: M. BURNYEAT (ed.). Skeptic Tradition. Berkeley, University of California Press, p.65-93. INWOOD, B.; GERSON, L. P. (1988). Hellenistic Philosophy: Introductory Readings. Indianapolis, Hackett Publishing Co.
LESSES, G. (1988). Content, Cause and Stoic Impressions. Phronesis vol. XLIII/1, p.2- 24. LIDDELL, H; SCOTT, R; Jones, H. (1940). GreekEnglish Lexicon. Oxford, Clarendon. LONG & SEDLEY. (1987a). Hellenistic Philosophers, vol I. Cambridge, Cambridge University Press. LONG & SEDLEY. (1987b). Hellenistic Philosophers, vol II. Cambridge, Cambridge University Press. LONG, A A. (1991). Representation and the self in Stoicism. In: STEPHEN EVERSON (ed.). Companions to Ancient Thought 2: Psychology. Cambridge, Cambridge University Press, p.102-120. NUSSBAUM, M. (1978). Aristotles’ de motu Animalium. Princeton, Princeton University Press. HICKS, R. D.(1925). Diógenes Laércio. Lives of Eminent Philosophers, vol. I, II. (translation, introduction and notes). Harvard, Loeb Classical Library. RACKHAM, H. (1942). Cícero. On the Orator: Book 3. On Fate. Stoic Paradoxes. Divisions of Oratory. (translation, introduction and notes). Trad. Harvard: Loeb Classical Library. SEDLEY, D. (1993). Chrysippus on psychophysical causality. In: NUSSBAUM, M. C. (ed.). Passions and Perceptions - Studies in Hellenistic Philosophy of Mind. Cambridge, Cambridge University Press, p. 313-331. SEDLEY, D. (2014). A definição de Zenão de phantasia kataleptike. Prometeus, n. 15, p. 147- 164. VON ARNIM, H. (2005). Stoicorum Veterum Fragmenta Volume 1: Zeno or Zenonis Discipuli. Berlim, De Gruyter. VON ARNIM, H. (2005). Stoicorum Veterum Fragmenta Volume 2: Chrysippi Fragmenta Logica et Physica. Berlim, De Gruyter,. VON ARNIM, H. (2005). Stoicorum Veterum Fragmenta Volume 3: Chrysippi fragmenta moralia. Fragmenta Successorum Chrysippi. Berlim, De Gruyter. VON ARNIM, H. (2005). Stoicorum Veterum Fragmenta Volume 4: Indeces. Berlim, De Gruyter. WATSON, G. (1966). The stoic theory of knowledge. Belfast, Queens University Classics.